Product prices and availability are accurate as of 2019-04-21 14:30:53 EDT and are subject to change. Any price and availability information displayed on http://www.amazon.com/ at the time of purchase will apply to the purchase of this product. Energy Saving, Long Life Expectancy, Low Power Consumption, Rechargeable. 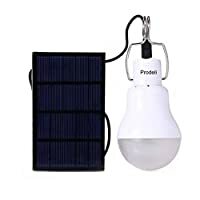 Ideal for home lighting, camping, cooking, working, reading, emergency and blackouts,etc. Power source: Solar panel, home electricity charging, 2 methods for charging the LED solar light. With built-in high capacity and durable rechargeable battery, the solar panel can convert the solar energy to electric energy and store it when under sunshine, which is environment-friendly. This solar shed light can be charged by solar panel as well as charged by 5-8V charger. The charged bulb can be used as a mobile lighting lamp. Convenient with a metal wire hook bulb can be hung using or take down anytime, such as hands free while your work. Energy saving, low consumption, high brightness, stable performance, rechargeable. The system is mainly composed of solar panel, light source and 850ma/3.7V battery. Suitable for home emergency lighting and outdoor use such as hiking, camping, cooking, reading, fishing, beach tent etc.